A simple guide to understanding their decline and requirements. 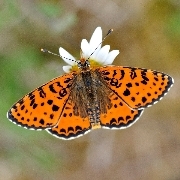 There are thousands of species of butterfly and moth in France. Along with most insects they have declined horrendously in recent years and it's not too hard to see what is driving this collapse. As per usual it's a combination of habitat loss and general mismanagement of the world we live in with agriculture at the heart of it. What isn’t obvious to most people is that as a general rule each species is restricted to either one or two specific plant species or perhaps a single family group of plants as a food source for the caterpillar stage. What this means is that several criteria have to be met for the successful continued survival of any given species within a specified area. 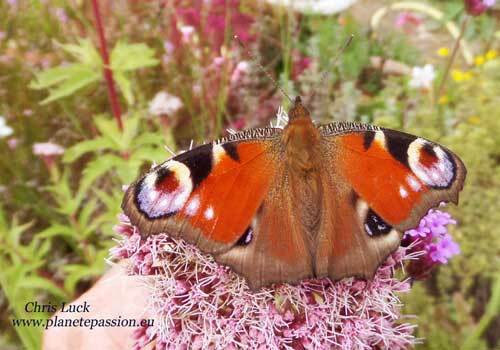 This is of course equally true for many creatures, but sticking with butterflies and moths they require the appropriate food plant for their caterpillars and that food plant has to remain in place for the full development of the caterpillar. They then require an appropriate structure on or in which to pupate which must also remain undisturbed until they are ready to emerge. Following the emergence of the adult butterfly or moth, (which may be almost a year later), it then requires, in most instances, a suitable supply of nectar. It is this last requirement that most people focus on and it is generally the easiest to satisfy but that simply isn’t good enough if taken in isolation. Granted not many of us have any control over what happens outside of our own little patch but there are things that many of us can do in our own little way by considering their requirements. If we take a couple of simple examples of common species it should be clear that we have to provide for the entire life cycle, however this may not be as simple as it seems without knowing what is required by every species and that's too much for most people including me. What we can do is try to provide native plant species and manage these areas with the minimum of disturbance. Some examples of common species. 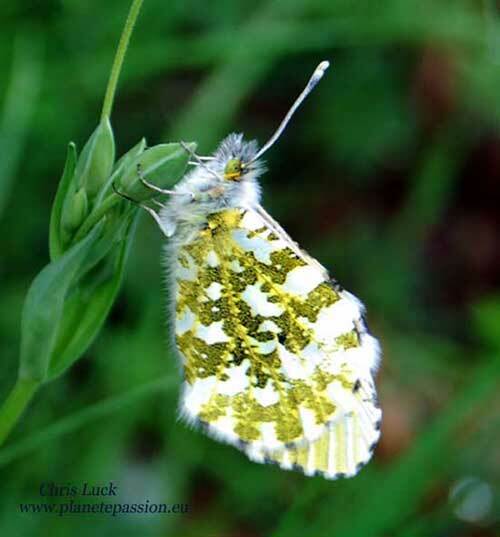 The Orange Tip Butterfly, (Anthocharis cardamines), is the first of the butterflies to be seen in early spring that has spent the winter as a pupa, (Chrylis). Having emerged they will wander substantial distances looking for nectar and breeding partners, but perhaps more importantly the females need the right plant to place her eggs. These are members of the crucifer family, principally Cuckooflower (Cardamine pratensis) in damp meadows and Garlic Mustard (Alliaria petiolata) alongside road the edges of roads, tracks and ditches. 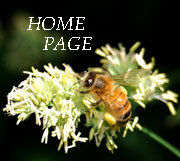 Females only place one egg per flower head and only on plants in full sun that have commenced flowering. Once hatched the caterpillar feeds on the host plant and seed heads, then after about 3 or 4 weeks the caterpillar leaves the plant to pupate nearby on low vegetation. Then the long wait of as much as 330 days commences until the following spring for it to complete its life cycle. As can be seen with usually just the one generation a year it’s a process that requires a stable habitat with minimal or zero cutting. Another common butterfly is the Peacock, (Aglais io). This butterfly spends the winter in the adult form and can be sometimes be seen on warm, sunny winters days when the temperature wakes them from their hibernation that takes place in dark, cool places that are frost protected, sheds, cellars, caves etc. There is usually one, sometimes two broods a year. 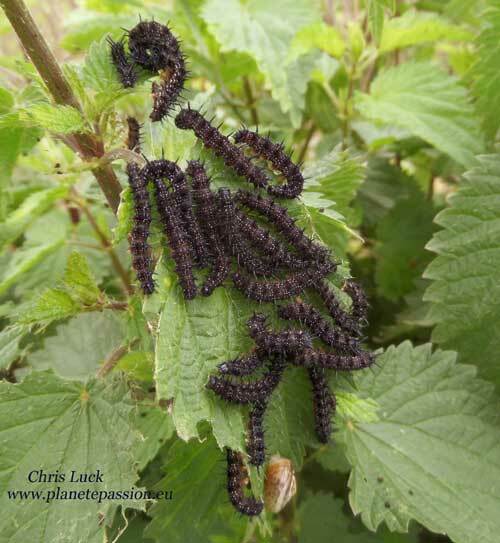 Eggs are laid in large clusters on nettle leaves where the hatching caterpillars spin webs for protection. From egg laying to fully grown caterpillars takes about 6 or 7 weeks, any destruction of the nettles during this period will result in their death. When fully grown the caterpillars descend to the ground and wander off, often in lines or groups, to find places to pupate in any bushes or trees that are close by. 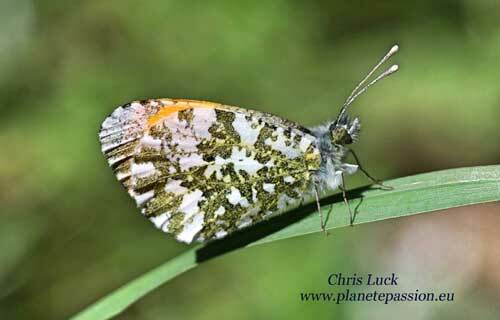 The emergent butterflies then feed until the onset of winter signals the time to hibernate. The principle dangers here from human activity are the poisoning or cutting of nettles and the removal of late nectar sources such as Ivy. 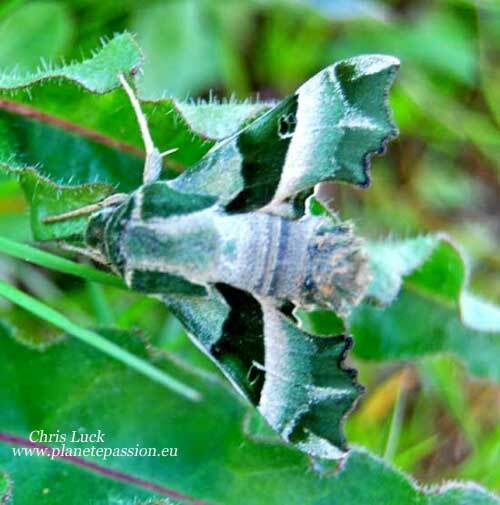 The Willowherb Hawk Moth Proserpinus proserpina is relatively widespread throughout France and as the name implies the caterpillars feed on various willowherbs and evening primroses. 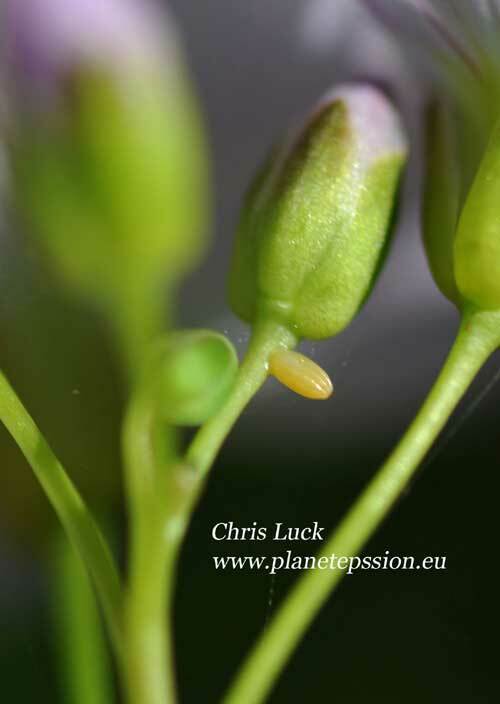 Eggs are deposited on the host plants in May and June when the adult moths hatch. 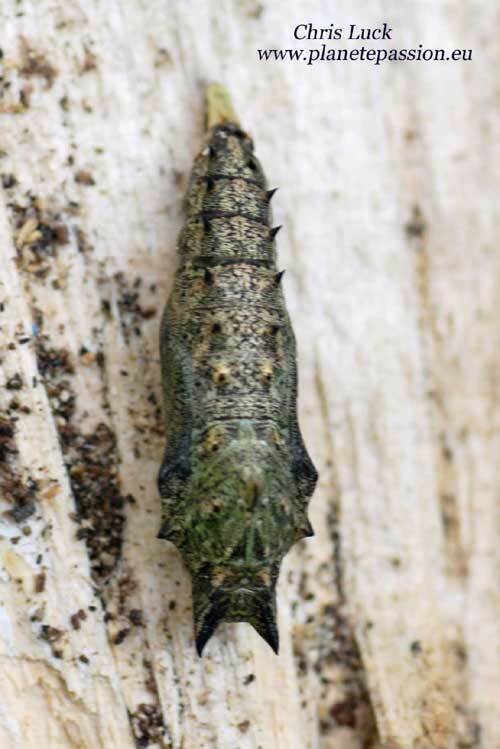 In July and August the developed caterpillars look for suitable soil to burrow into in order to pupate where they will remain until the following year. Dangers here are cutting or poisoning of the host plants when the caterpillars are present and the ploughing, digging, or use of pesticides of any type where the pupa are in the ground. 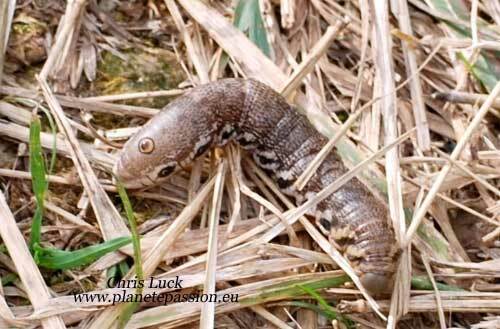 This is an issue for most Hawk moth species that pupate in the soil, often for as long as 8 or 9 months. It can be seen from these few examples that if we are to save our butterflies and moths it will require a much more thoughtful and sensitive approach regarding how we manage our landscape. Mercifully synthetic pesticides of all types are now illegal in France for members of the public to use in their gardens or on their land. It is also illegal to use them in public places which is another helpful step in the right direction for insects in general and the large number other creatures that depend on them as a food source.